For 85% of our Alaskan Cruise we had very mild weather – it was warmer than I expected and didn’t rain much at all! Ketchikan was the coolest (as in temperature) destination, and it was also the wettest. Since I assumed all of the places we’d visit would be rainy, I brought along my go-to rain boots and this water-repellent quilted jacket. I really only needed them one day off the ship! We really lucked out – I would advise anyone going to Alaska to bring a pair of rain boots and a warm jacket regardless… this mild weather was a rare occurrence! I also brought a number of cozy flannel shirts to wear on the boat and off. I have a favorite red + black buffalo check one from Old Navy a couple years ago, as well as one I picked up in London this fall, but wanted something a little more basic to wear with my favorite white jeans. Right before my trip I hopped on over to Nordstrom to see if they had any good layering basics, and found this Rails shirt. It is sooooooooooo soft. I love how it’s long enough to cover my booty, but not too long (like some Equipment shirts are). It was the best choice for this chilly, rainy day exploring Ketchikan! Instead of participating in an excursion here, we decided to spend several hours walking around the city. I’m a big believer in getting to know a city that way – I usually find it more enjoyable than doing something touristy or cheesy like going to a Lumberjack Show or a Crab Bake. Plus, you get the best photos with no one around! 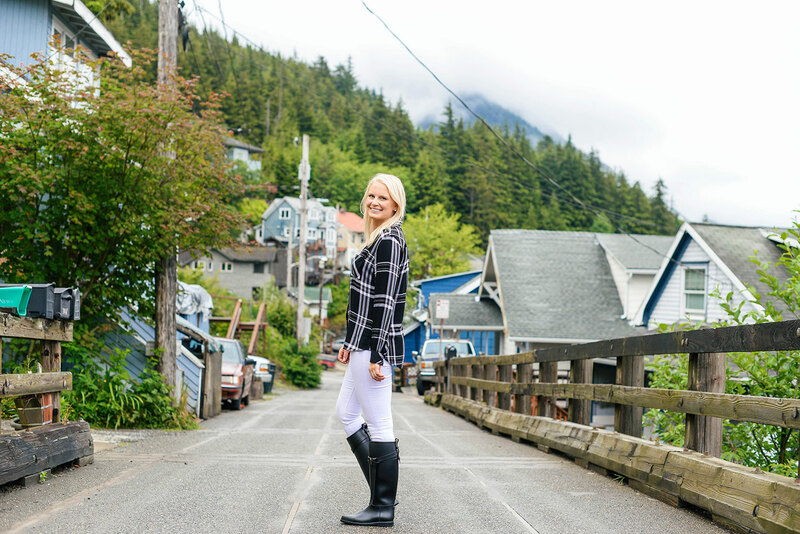 Tomorrow I’ll be sharing the pics I took while walking around this teeny tiny fishing village and more info on what to do in Ketchikan – stay tuned! I’ve wanted a shirt by Railes forever, they look so comfy. You look adorable! Love this plaid! I just bought a Rails shirt this week in Colorado! I hadn’t paid much attention to the brand before. But in person, the softness caught my attention. Love that black & white plaid! Should I be embarrassed that Alaska remind me of that movie with Sandra where she makes her assistant be her fiancé?